If you have been to Souvla, you’ll have tried their Cypriot Grain Salad. They have some fantastic salads here, but the Grain Salad is the best and a signature dish if you ask me. It’s a unique, healthy salad packed full of goodness. Even if you aren’t a believer in ‘health food’ per se, this salad will alter your perception that everything that’s good for you tastes bad (this was also my perception, up until not too long ago). This is a fabulous recipe for anyone doing the Wild Rose Herbal Detox, just omit the yoghurt, raisins, pomegranate, vinegar and honey. I’ve included a Wild Rose-friendly dressing recipe below. Imagine my surprise and absolute glee when I found a video of Chef Michael van Warmelo demonstrating the recipe on their Facebook page! It easy to prepare, easy to assemble, and a real crowd pleaser at a BBQ or dinner party. It’s great served with grilled meats, chicken, tasty grilled fish, or even as a by itself. ♥ Cook the bulgur wheat according to instructions on the packet (for extra flavour, you can cook it in chicken stock). Cook the lentils in simmering water until soft, around 10-15 minutes. They should not be too soft and still have a bit of bite. Drain and cool both completely before mixing. They should not be at all soggy. ♥ While you’re waiting, soak the raisins, whisk the vinaigrette. Prepare the yoghurt – mix 1 cup of yoghurt with honey, cumin seeds and lemon juice. De-seed the pomegranate – cut the fruit in half width-ways (with the two pointy ends on either side), place them in a large bowl covered with cold water and gently coax the seeds from the white pith. ♥ Right before mixing, chop the herbs, then mix with the bulgur wheat, lentils, pumpkin seeds, chopped almonds, pine nuts, red onion and raisins. Toss with the vinaigrette and season with salt and pepper. 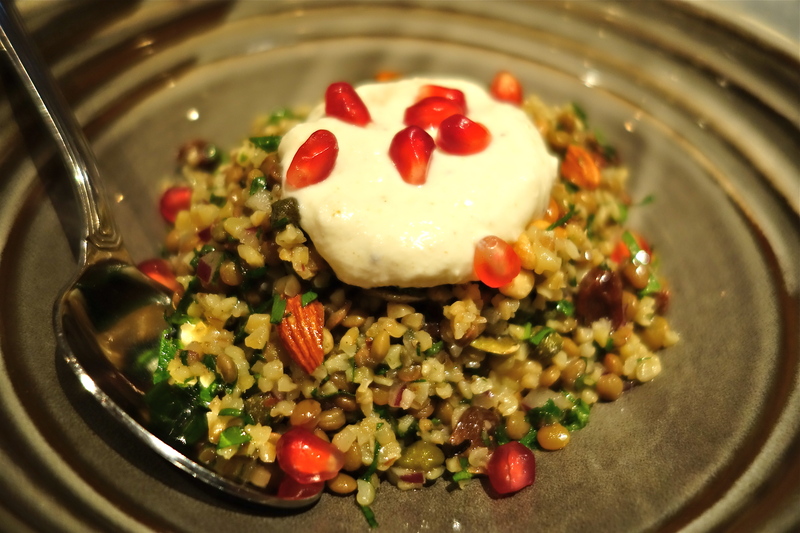 Assemble the dish by plating the mixture, top with the prepared greek yoghurt and finally, pomegranate seeds. Note: In the video the chef says that the bulgur wheat doesn’t need to be cooked, just soaked in water. I soaked it in room temperature water, which didn’t end with right result and it was still hard. Perhaps he meant soaking it in hot water? Either way, I cooked it to ensure a nice, fluffy and thoroughly cooked bulgur wheat! Note: I add much more pomegranate seeds than are shown in the photo; I love the ‘POP’ when you bite down on them, and the sweetness really ties the whole dish together.